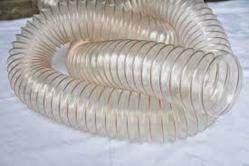 Trader of PU Hoses and covering Ahmadabad and all India. This lightweight component is offered in sizes of 32mm to 350mm with transparent color. By providing quality oriented production, we give a reason to rely on us. It can perform in any weather condition or high temperature without any leak. We believe in quality, so we try to bring perfection in the designs in each of our components. We have well-developed infrastructure facility that also involve quality testing unit to ensure its superb performance. 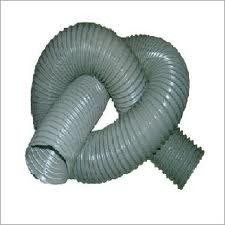 Our collection of Polyurethane Hoses widely acclaimed for its long-term working in domestic or industrial places. Std. Length 10mtr., 15mtr., 20mtr. Spiral Steel Wire Copper Coated Transparent"PU" Duct Hoses, Flexible hoses – 50mm dia, 60mmdia, 75mm dia, 85 mm dia, 100mm, 125mm, 160mm dia. 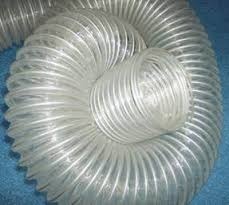 We are a top notch supplier of Textile Cotton Dust Hoses.